For the yet unreleased device announced on March 20 2019, see Oculus Rift S.
Oculus Rift is a virtual reality headset developed and manufactured by Oculus VR, a division of Facebook Inc., released on March 28, 2016. This is the first generation device, and is succeeded by Oculus Rift S, scheduled for release in spring of 2019. Oculus Touch motion tracked controllers. Oculus initiated a Kickstarter campaign in 2012 to fund the Rift's development, after being founded as an independent company two months prior. The project proved successful, raising almost US$2.5 million from around 10,000 contributors. In March 2014, Facebook purchased Oculus for $2 billion. In March 2017, after three years at the company, it was announced Oculus founder and creator Palmer Luckey was leaving Facebook. The Rift has gone through various pre-production models since the Kickstarter campaign, around five of which were demonstrated to the public. Two of these models were shipped to backers, labelled as development kits; the DK1 in mid 2013 and DK2 in mid-2014, to give developers a chance to develop content in time for the Rift's release. However, both were also purchased by a large number of enthusiasts who wished to get an early preview of the technology. The Rift has two Pentile OLED displays, 1080×1200 resolution per eye, a 90 Hz refresh rate, and 110° field of view. The device also features rotational and positional tracking, and integrated headphones that provide a 3D audio effect. Through Meant to be Seen (MTBS)'s virtual reality and 3D discussion forums, Palmer Luckey, the founder of Oculus and longtime MTBS discussion forum moderator, developed the idea of creating a new head-mounted display that was both more effective than what was then on the market, and inexpensive for gamers. The first rough prototype was hacked together in 2011 by Palmer Luckey (then 18 years old) in his parents’ garage in Long Beach, California. Coincidentally, John Carmack had been doing his own research and happened upon Luckey's developments as a fellow member of MTBS. After sampling an early prototype, Carmack favored Luckey's approach and just before the 2012 Electronic Entertainment Expo, Id Software announced that their future updated version of Doom 3, BFG Edition, would be compatible with head-mounted display units. 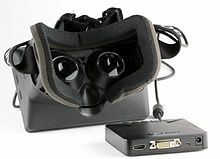 In June 2012, during the E3 convention, Carmack introduced a duct taped head-mounted display based on Luckey's Oculus Rift prototype, which ran Carmack's own software. The unit featured a high speed IMU and a 5.6-inch (14 cm) LCD, visible via dual lenses, that were positioned over the eyes to provide a 90 degrees horizontal and 110 degrees vertical stereoscopic 3D perspective. Two months after being formed as a company, Palmer's Oculus VR launched a Kickstarter crowdfunding campaign on August 1 of 2012 for their virtual reality headset, which was named the Rift. The main purpose of the kickstarter was to get an Oculus Rift prototype—now referred to as DK1 (Development Kit 1)—into the hands of developers to begin integration of the device into their games. DK1 was given as a reward to backers who pledged $300 or more on Kickstarter, and was later sold publicly for $300 on their website. These kits sold at a rate of 4–5 per minute for the first day, before slowing down throughout the week. The Rift DK1 was released on March 29, 2013, and used a 7-inch (18 cm) screen with a significantly lower pixel switching time than the original prototype, reducing latency and motion blur when turning one's head quickly. The pixel fill is also better, reducing the screen door effect and making individual pixels less noticeable. The LCD was brighter and the color depth is 24 bits per pixel. The 7-inch screen also makes the stereoscopic 3D no longer 100% overlapping, the left eye seeing extra area to the left and the right eye seeing extra area to the right. The field of view (FOV) is more than 90 degrees horizontal (110 degrees diagonal), which is more than double the FOV of previous VR devices from other companies, and is the primary strength of the device. The resolution is 1280×800 (16:10 aspect ratio), which leads to an effective of 640×800 per eye (4:5 aspect ratio). However, since the Rift does not feature a 100% overlap between the eyes, the combined horizontal resolution is effectively greater than 640. The image for each eye is shown in the panel as a barrel distorted image that is then corrected by pincushion effect created by lenses in the headset, generating a spherical-mapped image for each eye. Initial prototypes used a Hillcrest Labs 6DoF head tracker that is normally 125 Hz, with a special firmware requested by John Carmack that makes it run at 250 Hz, tracker latency being vital due to the dependency of virtual reality's realism on response time. The latest version includes Oculus's new 1000 Hz Adjacent Reality Tracker, which will allow for much lower latency tracking than almost any other tracker. It uses a combination of three-axis gyros, accelerometers, and magnetometers, which make it capable of absolute (relative to Earth) head orientation tracking without drift. The Development Kit 1 also included interchangeable lenses that will allow for simple dioptric correction. The entire source for the Rift DK1 was released to the public in September 2014, including the firmware, schematics, and mechanicals for the device. The firmware is released under a simplified BSD license, while the schematics and mechanicals are released under a Creative Commons Attribution 4.0 International License. In June 2013, a prototype of the rift that used a 1080p LCD panel was shown at Electronic Entertainment Expo. This step forwards to twice the number of pixels as DK1 significantly reduced the screen door effect and made objects in the virtual world more clear, especially at a distance. The poor resolution had been the main criticism of the DK1. This HD prototype is the only prototype of the Rift shown to the public which did not turn into a publicly available developer kit. In January 2014, an updated prototype codenamed "Crystal Cove" was unveiled at Consumer Electronics Show, which used a special low-persistence of vision OLED display as well as a new motion tracking system that utilized an external camera to track infrared dots located on the headset. The new motion tracking system would allow the system to detect actions such as leaning or crouching, which was claimed to help alleviate sickness experienced by users when the software did not respond to these actions. Oculus began shipping Development Kit 2 (DK2) in July 2014. This is a small refinement of the "Crystal Cove" prototype, featuring several key improvements over the first development kit, such as having a higher-resolution (960×1080 per eye) low-persistence OLED display, higher refresh rate, positional tracking, a detachable cable, and the omission of the need for the external control box. A teardown of DK2 revealed that it incorporates a modified Samsung Galaxy Note 3 smartphone display, including the front panel from the device itself. In February 2015, Oculus announced that over 100,000 DK2 units had been shipped up until that point. In September 2014, Oculus once again presented an updated version of the Rift, codenamed Crescent Bay. This version has a greater resolution than the DK2, a lower weight, built-in audio, and 360-degree tracking thanks to the presence of tracking LEDs in the back of the headset. Oculus has also licensed software library RealSpace3D, which is expected to provide the Rift with HRTF and reverb algorithms. During a panel at SXSW 2015, titled "Explore the Future of VR", it was publicly announced for the first time that the prototype uses two screens instead of one as previously thought. Oculus Rift, sometimes referred to as "Consumer Version 1" or "CV1." Oculus VR announced on May 6, 2015, that the consumer version of the Rift would ship in the first quarter of 2016 with pre-orders starting on January 6, 2016, at 8 am PST. On January 5, 2016, the day before pre-orders went live, in an update posted to the original Kickstarter page, it was announced that all Kickstarter backers who pledged for a Rift development kit would get a free KickStarter Edition Oculus Rift. On January 6, 2016, pre-orders started, at $599.99. At the same time the shipment date was announced for March 28, 2016. On January 16, 2016, shipping dates for new orders of the Rift were delayed until July 2016 due to the number of pre-orders on day 1. On March 25, 2016, the first batch of Oculus Rift virtual reality headsets began shipping to consumers. On April 12, 2016, customers were notified that their shipments were pushed back due to early component shortage. The dates varied between 3 and 8 weeks of delay in regards to previous estimates. The consumer version is an improved version of the Crescent Bay Prototype, featuring per-eye displays running at 90 Hz with a higher combined resolution than DK2, 360-degree positional tracking, integrated audio, a vastly increased positional tracking volume, and a heavy focus on consumer ergonomics and aesthetics. During Oculus Connect in June 2017, Oculus VR announced and released their Oculus Rift for Business bundle for US$900, which included the Rift HMD, Oculus Touch controllers, and expanded warranty, preferential customer service, commercial use license, three Constellation sensors, an Oculus remote, and three Rift Fits (the name given to the piece that cushions the device onto the user's face). In June 2015, Oculus VR revealed that it was already working on a successor to the original Rift and planned to release it in around 2–3 years from the Rift's release. On March 20 2019, Oculus released a new head-mounted display called "Oculus Rift S," clarifying that it is not called "Rift 2" because Rift S is a replacement for the original Rift, not a sequel. Oculus Rift S has a 2,560×1,440 LCD @ 80Hz and slightly larger field of view than that of Rift, but no hardware IPD adjustment (IPD adjustment is software-only). Oculus Rift S features inside-out tracking with 5 cameras, four arranged similarly to those of Oculus Quest (two cameras face forward, one left and one right) and one more camera facing upwards toward the ceiling. Oculus Rift S relies on different connectors: one DisplayPort 1.2 and one USB 3.0 port. The device targets the same price point ($400) and PC hardware as the original Rift, and will replace the original Rift which the company says is being phased out. Shortly before the Oculus S announcement the original Rift started disappearing from physical third-party stores, making it available only via the official Facebook listing. During the Rift S announcement Facebook stated that Rift S will replace the original Rift. Shortly afterwards most sellers stopped replenishing their Rift stock. Oculus VR plans to support the original Rift with software updates for "the foreseeable future." The remote included with first shipments of Rift, sometimes referred to as "Consumer Version 1" or "CV1". Was used for Home navigation and with select titles until introduction of Oculus Touch controllers. The Oculus Rift headset uses an OLED panel for each eye, each having a resolution of 1080×1200 at 90Hz, and uses lenses that allow for a wide field of view. The separation of the lenses is adjustable by a slider on the bottom of the device, in order to accommodate a wide range of interpupillary distances. The same pair of lenses are used for all users; however, there are multiple facial interfaces so that the device can be positioned at different distances from the user's eyes. This also allows for users wearing glasses to use the Rift, as well as users with widely varying facial shapes. Headphones are integrated, which provide real-time 3D audio effects. This was developed from technology licensed from RealSpace 3D Audio, by Visisonics. The Rift has full 6 degree of freedom rotational and positional tracking. This tracking is performed by Oculus's Constellation tracking system and is precise, low-latency, and sub-millimeter accurate. Constellation is the headset's positional tracking system, used to track the position of the user's head as well as other VR devices, consisting of external infrared tracking sensors that optically track specially designed VR devices. The Rift, or any other device being tracked by the system, is fitted with a series of precisely positioned infrared LEDs under or above the surface, set to blink in a specific pattern. By knowing the configuration of the LEDs on the objects and their pattern, the system can determine the precise position of the device with sub-millimeter accuracy and near-zero latency. The system then includes one or more USB stationary infrared sensors that originally come with a stand in a desk lamp form factor, but standard screw holes allow for the stand to be removed and the sensor to be mounted anywhere the user sees fit. The sensors normally sit on the user's desk, creating a 3D space that allows the user to use the device while sitting, standing, walking, or even jumping around the room. In its initial presentation, before the Touch controllers were released, the system was only used to track the head-mounted display, and a single sensor was included with the device, which was sufficient there being no chance of the user's hands blocking the headset from it. When Touch controllers were released, two-sensor setups became the baseline, in order to guarantee proper tracking of the headset and controllers. For "room scale" virtual reality, three or more sensors are required. When the controllers were purchased separately, a second sensor sensor was included, and the standard Rift bundle was updated to include the controllers and additional sensor. Additional sensors, placed behind the user, allow for 360º rotation without the sensors being occluded by the user them self. Three- and four-sensor configurations become the standard for this scenario. Oculus will allow third-party peripheral manufacturers to create their own devices that are tracked by the system, providing an API for them to use. As a result of a partnership with Microsoft, early Oculus Rift units were bundled with an Xbox One controller. The reason for this inclusion was that, in lack of motion controllers such as the Oculus Touch, the majority of virtual reality games that had been in development up to that point required a gamepad, so it was intended to allow users to play those games without the need to purchase any additional hardware. The Oculus Rift's motion controller system is known as Oculus Touch. It consists of a pair of handheld units, one for each hand, each containing an analog stick, three buttons, and two triggers (one commonly used for grabbing and the other for shooting or firing). The controllers are fully tracked in 3D space by the Constellation system, so they may be represented in the virtual environment, and each controller features a system for detecting finger gestures the user may make while holding them. Each controller uses a single AA alkaline cell. Initially released as a standalone accessory for the Rift, pre-orders for Oculus Touch began on October 10, 2016, with priority granted until October 27 to those who had originally pre-ordered Oculus Rift, and they were finally released on December 6, 2016. In August 2017, the standard Rift bundle was modified, dropping the Oculus Remote, replacing the Xbox One controller with the Oculus Touch, and adding a second tracking sensor. When the user puts on the Rift and no other content is being outputted to the headset, they are presented with Oculus Home. This is the default environment of the Rift, which presents them with a loft environment and a floating menu, allowing the user to launch VR applications they own, see if their friends are using the Rift, and purchase virtual reality content on the Oculus Home store from the headset. An update to the base software, called Core 2.0, introduced a more interactive default environment, allowing the user to navigate and customize it with imported 3D models. Oculus maintains a market place for applications for the headsets. The listings are curated to only allow applications that run smoothly on the recommended hardware. Most listings are also rated on their comfort level based on their likelihood of causing motion sickness or number of jump scares. However, developers do not have to use Oculus Home to distribute content for the Rift, this being entirely optional. The Store can be accessed from the VR-based Oculus Home, from its desktop app, or on the Oculus web site under the section "Experiences." Content for the Rift is developed using the Oculus PC SDK, a free proprietary SDK available for Microsoft Windows (OSX and Linux support is planned for the future). This is a feature complete SDK which handles for the developer the various aspects of making virtual reality content, such as the optical distortion and advanced rendering techniques. The Oculus SDK is directly integrated with the popular game engines Unity 5, Unreal Engine 4, and Cryengine. This allows for developers already familiar with these engines to create VR content with little to no VR-specific code. The Rift is an open platform, and thus developers do not need any approval or verification to develop, distribute, or sell content for it, and do not have to pay any licensing fees. The SDK, however, cannot be modified or reused for other purposes or hardware without permission. Content developed for the Development Kit 2 using SDK version 0.8 or above are compatible with the Rift; however, content developed for the Development Kit 1 or with older versions of the SDK will have to be recompiled using the latest SDK version to be compatible. On 21 December 2015, Oculus announced the release of their finalized Rift 1.0 SDK, combined with the start of shipping their final version of the Oculus Rift VR headset to developers. At Oculus's 3rd annual conference (Oculus Connect 3), it announced the new technology, called "Asynchronous Spacewarp (ASW)". This technology allows the Rift to compensate for the dropped frames. According to Oculus, ASW reduces the minimum specs of a PC to run the Rift without any judder. In May 2015, Oculus VR announced "recommended" hardware specifications for computers utilizing Oculus Rift, specifying a CPU equivalent to an Intel Core i5-4590, at least 8GB of RAM, at least an AMD Radeon R9 290 or Nvidia GeForce GTX 970 graphics card, an HDMI 1.3 output, three USB 3.0 ports, and one USB 2.0 port. Oculus VR stated that these requirements would remain in force for the life of the first consumer model. The company also stated that while upcoming discrete GPUs for laptops may be able to reach the required performance for Oculus Rift, systems that switch between integrated and discrete graphics may not handle output in a manner that supports the device. Oculus Rift only supports 64-bit versions of Microsoft Windows 7 SP1 or later; Oculus VR stated that the device would initially support Windows only in order to focus on "delivering a high[-]quality consumer-level VR experience"; support for Linux and macOS will be developed in the future. A hardware testing application is available, and Oculus VR has also certified and promoted specific models of pre-built computers that meet these recommendations, from vendors such as Asus, Alienware and Dell Inc., as being "Oculus Ready". On October 6, 2016, Oculus VR announced lessened hardware recommendations, now suggesting an Intel Core i3-6100 or AMD FX 4350 CPU, at least a GeForce GTX 960 or equivalent graphics card, two USB 3.0 ports and one USB 2.0 port, and Windows 8 or newer. The company stated that these lower requirements were enabled by the adoption of motion interpolation; on systems that cannot handle full 90 frames per second rendering, the drivers will allow software to render at 45 FPS instead, and generate frames based on differences between them to send to the headset to maintain its frame rate. Oculus promoted that these changes lowered the average hardware cost of a PC meeting these specifications to US$500 and would also enable certain laptops to run Oculus Rift. In June 2018, Oculus VR updated its recommended OS spec to Windows 10. While Windows 7 and Windows 8.1 users would still be able to access the standard Rift experience, newer features and apps might require an upgrade to Windows 10. Oculus has stated that the Rift is primarily a gaming device and that their main content focus is gaming. Existing games with a first-person or fixed-camera perspective can be ported to VR with some development effort. However, Oculus has stated that the best virtual reality experiences are those that are designed, from the beginning, for the Rift. A number of AAA games have added Rift support (and can be played with the Development Kit 2), including Project CARS, Elite: Dangerous, Euro Truck Simulator 2, and Dirt Rally, as well as a number of indie games such as AaAaAA!!! – A Reckless Disregard for Gravity and Ether One. Fans and hobbyists have also modded support for the Rift into several popular titles which allow for extensive low-level modding, including Minecraft and Flight Simulator X. At the release event for the Rift in June 2015, Oculus announced 9 launch titles for the Rift, including EVE: Valkyrie by CCP and Edge of Nowhere by Insomniac Games. It also announced that it was working with other developers including Final Fantasy developer Square Enix, Rock Band developer Harmonix, and The Order: 1886 developer Ready at Dawn. In July 2015, Oculus revealed that it was fully funding more than 20 second party high production value games made exclusively for the Rift, one of these being Insomniac's Edge of Nowhere. In July 2017, Marvel announced in the Disney's D23 event that it will be bringing 12 superheroes of theirs to VR with an Oculus exclusive game called Powers United VR. Oculus is including Oculus Cinema as a free application, which allows the Rift to be used to view conventional movies and videos from inside a virtual cinema environment, giving the user the perception of viewing the content on a cinema-sized screen. Oculus Cinema will also have a networked mode, in which multiple users can watch the same video in the same virtual space, seeing each other as avatars and being able to interact and talk to one another while watching the video. The Rift also offers the opportunity to view new types of media that are impossible to view on regular monitors; 360° 3D videos and 'virtual reality movies' (an entirely new medium). Spherical videos (commonly called 360° videos) can be viewed simply by the user moving their head around, and the Rift opens up the possibility for stereoscopic spherical videos (commonly called 360° 3D videos). In September 2014, NextVR announced that they would be using a $200,000 camera rig to produce 360° 3D content for the Rift, including short films, as well as live streaming live events such as sports or concerts in 360° 3D. In July 2015, Oculus announced a deal with Canadian film company Felix & Paul Studios to produce 360° 3D videos for the Rift. The Rift also supports a new medium of entertainment experiences, which Oculus calls "virtual reality movies". Oculus has established Oculus Story Studio to develop this type of content for the Rift, a team which has multiple former employees from major VFX companies such as PIXAR and ILM. Oculus Story Studio showed off its first VR movie, Lost, at the 2015 Sundance Film Festival, gaining positive reviews from attendees. The studio intends to have 5 VR shorts released with the Rift at launch, including Lost, Bullfighter, Henry, Dear Angelica, and Kabloom. The Oculus rift is increasingly used in universities and schools as an educational tool. The ability to provide an immersive, engaging environment can assist a diverse range of students for learning. In particular, there appears to be benefits to medical, health science and exercise students when utilising the Oculus Rift as a supplement for content provided in anatomy and physiology. There is also an increasing uptake of the oculus rift within curricula in other fields such as marketing, architecture, clinical education, computer science and paramedics. Oculus believes that social applications will be the most popular virtual reality experiences in the long term. A number of social applications for the Rift are in development, and it is expected that there will be significant competition in the sector. In May 2015, AltspaceVR launched a public beta for DK2 owners to try out their social VR platform. AltspaceVR allows people to inhabit a shared virtual space with spatial voice communications, cast content from the Internet on virtual screens, and interact with objects (allowing activities such as playing chess or other board games). It also supports extra hardware like eye tracking and body tracking. In 2013, Philip Rosedale, the founder of Second Life, left Linden Lab to work on a new virtual world designed for the Rift, called High Fidelity, which will link thousands of user-hosted virtual environments together into a consistent virtual world. In May 2015, Linden Lab, the company behind Second Life, announced that they too were working on a new virtual world, codenamed Project Sansar, built for virtual reality headsets such as the Rift and Gear VR. Like Second Life, Sansar will be hosted on Linden's servers and lease virtual land to players, on which they can build and sell virtual items and services (which Linden will take a cut of). Linden Lab hoped to release Sansar by the end of 2016. As well as the consumer uses, the Rift has attracted significant interest from industry and professional spheres for productivity enhancement, visualization, and advertising. A number of architecture firms have been experimenting with using the Rift for visualization and design. With the right software, the Rift allows architects to see exactly what their building will look like and get an understanding of the scale that is impossible on a traditional monitor. In early 2015, Audi started using Rift Developer Kit 2's at dealerships to help customers configure the car they are interested in, as well as to see what driving a race in the car would be like. The Norwegian Army has been experimenting with the Rift Development Kit 2 to allow for a greater situational awareness of armoured vehicle drivers and commanders. Oculus Medium is a Painting Experience for Oculus Rift. In October 2016, the television series Halcyon was released as a "virtual reality series", where some episodes are broadcast on conventional television. and some as VR content for Oculus Rift. It is a crime drama following the world's first "VR Crimes Unit" in 2048. Fox Sports began producing content for the Oculus Rift and other virtual reality systems in fall 2016. Its initial content consisted mainly of Fox College Football coverage. Some online casinos have started using Oculus Rift to provide a unique online casino experience. A user can play slots and experience the lobby of a casino through a computer using a VR headset. ZeniMax Media, the parent company of Bethesda Softworks, which in turn owns Id Software, presented a lawsuit against Facebook, claiming the Oculus Rift was the product of intellectual property owned by ZeniMax, developed by John Carmack during his time working for Id Software. The jury ruled partially in favor of ZeniMax, finding the defendants did not steal trade secrets but had violated a non-disclosure agreement. Facebook and some of the Oculus corporate officers were ordered to pay a total of US$500 million. On March 10, 2017, it was revealed that Carmack was suing ZeniMax for US$22.7 million it owed him from their purchase of id Software. The Oculus Rift received generally positive reviews from gaming and tech websites. Wired gave 9 out of 10 stars to Oculus Rift and wrote, "The long-promised virtual reality headset is finally here, in a remarkably well-made and accessible device." A review by Dan Stapleton of IGN says, "The Oculus Rift is the first headset available, and it does a fantastic job of not just displaying high-quality VR, but making it easy to use." Many reviewers also wrote about the shortcomings of Rift, such as a hefty price tag ($599 in US) and the need of a powerful PC to run it. The Wall Street Journal wrote, "The first totally immersive home virtual reality rig is a pricey, awkward, isolating—and occasionally brilliant—glimpse of the future of computing." The Verge said, "Virtual Reality: 8/10. Virtual reality is always almost here." ^ a b Hayden, Scott (15 October 2018). "Facebook CEO Mark Zuckerberg: 'Oculus Quest Completes Company's First-Gen Lineup'". Road to VR. Retrieved 22 March 2019. ^ Hutchinson, Lee (22 March 2016). "Ask Ars: I can't choose between Oculus Rift, HTC Vive, and PlayStation VR!". Ars Technica. Retrieved 24 September 2016. ^ a b c Lang, Ben (20 March 2019). "Oculus Rift S Revealed with Inside-out Tracking, Resolution Bump, & New Ergonomics". Road to VR. Retrieved 20 March 2019. ^ "Oculus Rift: Step Into the Game". Kickstarter. Retrieved 17 June 2015. ^ a b Gleasure, R., & Feller, J. (2016). A Rift in the Ground: Theorizing the Evolution of Anchor Values in Crowdfunding Communities through the Oculus Rift Case Study. Journal of the Association for Information Systems, 17(10), 708-736. ^ "Iribe: Over 100,000 Oculus Rift DK2s Shipped". VRFocus. 16 February 2015. Retrieved 7 September 2015. ^ a b Binstock, Atman (15 May 2015). "Powering the Rift". oculus.com. ^ Digital Trends Staff (29 February 2016). "Oculus Rift vs. HTC Vive - Spec Comparison". Digital Trends. Retrieved 16 March 2016. ^ Orland, Kyle (28 March 2016). "The Ars review: Oculus Rift expands PC gaming past the monitor's edge". Ars Technica. Retrieved 29 March 2016. ^ "Meant to be Seen – View topic – Oculus "Rift" : An open-source HMD for Kickstarter". Mtbs3d.com. Retrieved 9 September 2013. ^ Don Woligroski (5 November 2013). "Neil Traces The History Of Oculus Rift And Vireio Perception". Tom's Hardware. ^ "The Inside Story of Oculus Rift and How Virtual Reality Became Reality". Wired. 20 May 2014. ^ Neil Schneider. "The #1 Stereoscopic 3D Gaming (VR Gaming, 3D Gaming) and VR Resource - Meant to be Seen - John Carmack Talks VR at QuakeCon 2012". mtbs3d.com. ^ Welsh, Oli (7 June 2012). "John Carmack and the Virtual Reality Dream". Eurogamer. Retrieved 1 August 2012. ^ Rosenberg, Adam (14 June 2012). "Hands-On With Oculus Rift, John Carmack's Virtual Reality Goggles". G4TV. Retrieved 28 January 2019. ^ "A Brief History Of Oculus". TechCrunch. 26 March 2014. Retrieved 17 July 2015. ^ "Update on Developer Kit Technology, Shipping Details". Oculus VR. 28 November 2012. Retrieved 20 March 2014. ^ "Oculus Rift pre-order open now". Mtbs3d.com. Retrieved 9 September 2013. ^ "Oculus Rift: Step Into the Game". Kickstarter.com. Retrieved 11 March 2017. ^ "Oculus Rift: Step Into the Game by Oculus » Online Pre-Orders Live! – Kickstarter". Kickstarter.com. Retrieved 9 September 2013. ^ "OculusVR/RiftDK1". github.com. Retrieved 29 September 2014. ^ "E3 2013: New 1080p Oculus Rift with Unreal Engine 4". IGN. 11 June 2013. Retrieved 1 November 2013. ^ "Oculus reveals Crystal Cove prototype virtual reality headset with intriguing OLED display". The Verge. 7 January 2014. Retrieved 7 January 2014. ^ "Announcing the Oculus Rift Development Kit 2 (DK2)". Oculus VR. 19 March 2014. Retrieved 31 August 2018. ^ Welch, Chris (31 July 2014). "New Oculus Rift dev kit uses the front of a Galaxy Note 3 as its screen". The Verge. Retrieved 21 March 2019. ^ "Brendan Iribe on Twitter: "Over 100k DK2's and tons of Gear VR's in the wild -- can't wait to see what the community creates. Everyone's a pioneer!"". Twitter. 12 February 2015. Retrieved 14 February 2015. 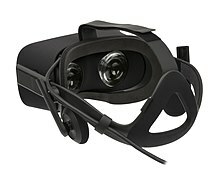 ^ a b "Oculus Unveils New Crescent Bay Rift Model With Integrated Audio, 360 Tracking". 20 September 2014. ^ "The Oculus Crescent Bay is a two-screen VR headset". The Verge. 14 March 2015. Retrieved 14 March 2015. ^ "First Look at the Rift, Shipping Q1 2016". oculus.com. 6 May 2015. ^ "Update 82: Thank you from Oculus · Oculus Rift: Step Into the Game". Kickstarter. Retrieved 21 March 2019. ^ "Oculus Rift - Oculus". Oculus.com. Retrieved 11 March 2017. ^ "Blog — Oculus Rift Pre-Orders Now Open, First Shipments March 28". Oculus.com. Retrieved 11 March 2017. ^ Falcon, Jonah (25 March 2016). "Oculus Rift VR headset starts shipping to customers". GameWatcher. Retrieved 25 March 2016. ^ "Blog — First Look at the Rift, Shipping Q1 2016 | Oculus - Oculus VR". Oculus. Retrieved 17 July 2015. ^ "Oculus is now selling its Rift headset to businesses with a new bundle". The Verge. Retrieved 19 December 2017. ^ VR, Oculus. "Announcing Oculus for Business: Bringing VR into the Workplace". Retrieved 19 December 2017. ^ "GameInformer.com". GameInformer.com. 22 June 2015. Retrieved 17 July 2015. ^ "Oculus Already Working on the Second Consumer Version of the Rift, Says Palmer Luckey - Virtual Reality & Oculus News and Events". Uploadvr.com. 7 July 2015. Retrieved 17 July 2015. ^ "Oculus Rift Sold Out In Stores, Only Available From Facebook". UploadVR. 15 March 2019. Retrieved 25 March 2019. ^ Robertson, Adi (20 March 2019). "The Oculus Rift is out of stock almost everywhere, still shipping "while supplies last"". The Verge. Retrieved 25 March 2019. ^ "Original Oculus Rift Will Be Supported 'For The Foreseeable Future'". UploadVR. 20 March 2019. Retrieved 25 March 2019. ^ a b "The Oculus Rift, Oculus Touch, and VR Games at E3". oculus.com. 11 June 2015. ^ a b "Palmer Luckey Explains Oculus Rift's Constellation Tracking and Fabric - VRFocus". VRFocus. Retrieved 17 June 2015. ^ "Room scale rifting. Oculus rift positional tracking with Touch". Virtual Reality & Oculus News and Events. Retrieved 17 June 2015. ^ Stuart Dredge (11 June 2015). "Oculus Rift virtual reality headset to ship with Xbox One controller". The Guardian. Retrieved 17 July 2015. ^ Elizabeth Bogart (12 June 2015). "Palmer Luckey Speaks Candidly About Xbox One Controllers Being Bundled with the Rift - Virtual Reality & Oculus News and Events". Uploadvr.com. Retrieved 17 July 2015. ^ Josh Constine. "Oculus Previews "Oculus Touch" Handheld Motion-Tracking Haptic Controllers". TechCrunch. AOL. Retrieved 17 June 2015. ^ Elyse Betters. "What is Oculus Touch and how does it work with the new Oculus Rift?". Pocket-lint. Retrieved 17 June 2015. ^ Makuch, Eddie (6 October 2016). "Oculus Touch Controllers Cost $200, Release Date Announced". GameSpot. Retrieved 11 December 2016. ^ "Oculus Touch Launches Today!". Oculus VR. 6 December 2016. ^ "Oculus User Guide" (PDF). 3 March 2015. Retrieved 27 June 2018. ^ "Asynchronous Spacewarp". developer.oculus.com. 10 November 2016. Retrieved 27 June 2018. ^ "Oculus Home will let you buy games straight from the Rift". TechRadar. Retrieved 17 July 2015. ^ "Facebook shows off Oculus Home improvements and Hybrid Apps". VentureBeat. 26 September 2018. Retrieved 26 September 2018. ^ "Oculus App Store Will Require Pre-Approvals, Comfort Ratings, Tax". TechCrunch. 12 June 2015. Retrieved 17 July 2015. ^ "Blog — Powering the Rift - Oculus VR". Oculus.com. 15 May 2015. Retrieved 7 September 2015. ^ "Creators — Home | Oculus". Developer.oculus.com. 2 February 2015. Retrieved 17 July 2015. ^ "Unity 5.1 is here! – Unity Blog". Blogs.unity3d.com. Retrieved 17 July 2015. ^ "VR". Unrealengine.com. Archived from the original on 29 June 2015. Retrieved 17 July 2015. ^ "CryENGINE Gets Oculus Support". VRFocus. 19 June 2015. Retrieved 17 July 2015. ^ Jarvis, Matthew (23 June 2015). "Oculus Rift 'will be an open platform', avoid 'console tactics', insists founder | Games industry news | MCV". Mcvuk.com. Retrieved 17 July 2015. ^ "Blog — Upcoming Oculus PC SDK 0.7 Compatibility Changes | Oculus". Developer.oculus.com. Retrieved 7 September 2015. ^ "Oculus shipping final Rift hardware to developers starting this week". Arstechnica.com. 22 December 2015. Retrieved 22 December 2015. ^ "Rift SDK 1.0 shipping to developers with final rift hardware". developer.oculus.com. 21 December 2015. Retrieved 22 December 2015. ^ "Here's the high-end PC you'll need to run the Oculus Rift". The Verge. Retrieved 19 August 2016. ^ "Oculus Rift Minimum PC Spec Finalized". GameSpot. CBS Interactive. Retrieved 19 August 2016. ^ a b "Here are the first Oculus Rift PC bundles, which you can pre-order Feb. 16". Polygon. Vox Media. Retrieved 19 August 2016. ^ a b "Oculus lowers minimum Rift specs using "asynchronous spacewarp" tech". Ars Technica. Retrieved 6 October 2016. ^ "Oculus Rift has a new minimum spec, $499 entry-level PC". Polygon. Retrieved 6 October 2016. ^ VR, Oculus. "Updating Rift's Minimum and Recommended Spec OS to Windows 10". Retrieved 16 July 2018. ^ Dan Kedmey (11 June 2015). "Oculus Rift Headset Available Early 2016, Xbox Controller Included". Time.com. Retrieved 17 July 2015. ^ "Connect: Developing VR Experiences with the Oculus Rift". YouTube. 29 October 2014. Retrieved 17 July 2015. ^ "Meant to be Seen - View topic - Minecrift release archive". Mtbs3d.com. Retrieved 17 July 2015. ^ "FlyInside - Virtual Reality Flight Simulation". Flyinside-fsx.com. Retrieved 17 July 2015. ^ Webster, Andrew (11 June 2015). "These are the first Oculus Rift games". The Verge. Retrieved 17 July 2015. ^ O'Brien, Lucy (11 June 2015). "E3 2015: Square Enix, Harmonix Among Oculus' Publisher Partnerships - IGN". Uk.ign.com. Retrieved 7 September 2015. ^ Parfitt, Ben. "Oculus Studios funding 20+ games | Latest news from the game development industry | Develop". Develop-online.net. Retrieved 17 July 2015. ^ Matney, Lucas. "Marvel is bringing its superheroes to VR with a new Oculus-exclusive game". ^ Westaway, Luke (13 October 2014). "Virtual reality and the silver screen: A match made in heaven". CNET. Retrieved 7 September 2015. ^ "Oculus Cinema to bring 'online multiplayer' experience to movie watching". SlashGear. Retrieved 7 September 2015. ^ "NextVR aims to transform sports entertainment forever". SlashGear. Retrieved 7 September 2015. ^ Clark, Liat (17 July 2015). "Oculus joins with VR filmmakers Felix & Paul (Wired UK)". Wired.co.uk. Retrieved 7 September 2015. ^ Volpe, Joseph (27 January 2015). "Oculus Story Studio is the Pixar of virtual reality". Engadget.com. Retrieved 7 September 2015. ^ "Introducing Oculus Story Studio on Vimeo". Vimeo.com. 26 January 2015. Retrieved 7 September 2015. ^ Dormehl, Luke (27 January 2015). "Oculus Debuts Pixar-Quality Virtual Reality Short At Sundance Film Festival | Fast Company | Business + Innovation". Fast Company. Retrieved 7 September 2015. ^ Moro, Christian; Štromberga, Zane; Stirling, Allan (29 November 2017). "Virtualisation devices for student learning: Comparison between desktop-based (Oculus Rift) and mobile-based (Gear VR) virtual reality in medical and health science education". Australasian Journal of Educational Technology. 33 (6). doi:10.14742/ajet.3840. ISSN 1449-5554. ^ Moro, Christian; Štromberga, Zane; Raikos, Athanasios; Stirling, Allan (1 November 2017). "The effectiveness of virtual and augmented reality in health sciences and medical anatomy". Anatomical Sciences Education. 10 (6): 549–559. doi:10.1002/ase.1696. ISSN 1935-9780. ^ Kuehn, Bridget M. (2018). "Virtual and Augmented Reality Put a Twist on Medical Education". JAMA. 319 (8): 756. doi:10.1001/jama.2017.20800. PMID 29417140. ^ Birt, James; Stromberga, Zane; Cowling, Michael; Moro, Christian (31 January 2018). "Mobile Mixed Reality for Experiential Learning and Simulation in Medical and Health Sciences Education". Information. 9 (2): 31. doi:10.3390/info9020031. ^ "Oculus Rift Inventor Palmer Luckey: Virtual Reality Will Make Distance Irrelevant (Q&A)". Recode.net. 19 June 2015. Retrieved 11 March 2017. ^ a b "Second Life Creator Linden Lab Prepares To Test Parallel VR Universe". Xconomy. 25 June 2015. Retrieved 7 September 2015. ^ "Eric Romo's AltspaceVR launches first VR social platform". Fortune. 20 May 2015. Retrieved 7 September 2015. ^ "Getting 'Physical' And Emotional In Virtual Reality : All Tech Considered". NPR. 1 June 2015. Retrieved 7 September 2015. ^ "New World Notes: SL Creator Philip Rosedale No Longer on Linden Lab's Board". Nwn.blogs.com. 23 October 2013. Retrieved 7 September 2015. ^ Robertson, Adi. "Inside High Fidelity, the virtual reality successor to 'Second Life'". The Verge. Retrieved 7 September 2015. ^ "Oculus Rift - Will be released". WillBeReleased.com. Retrieved 11 March 2017. ^ "Audi reveals virtual reality 'dealership in a briefcase'". Autoblog.com. 19 January 2015. Retrieved 7 September 2015. ^ "Audi partners with Somo to create fan experiences using Google Glass and Oculus Rift at Goodwood Festival of Speed". The Drum. 26 June 2014. Retrieved 7 September 2015. ^ Brandom, Russell (5 May 2014). "The Norwegian Army is using the Oculus Rift to drive tanks". The Verge. Retrieved 7 September 2015. ^ Tomas, Kot; Petr, Novak (2018). "Application of virtual reality in teleoperation of the military mobile robotic system TAROS". Journal. 15 (1): 172988141775154. doi:10.1177/1729881417751545. ^ Rœttgers, Janko (13 September 2016). "Fox Sports Streams College Football Match in Virtual Reality". Variety. Retrieved 26 October 2016. ^ "Gambling on virtual reality: the online casinos of the future". VentureBeat. Retrieved 14 February 2017. ^ "Online slots and the Oculus Rift VR glasses". Retrieved 14 February 2017. ^ "Facebook just lost a $500 million lawsuit — here's what's going on". Business Insider. 7 February 2017. ^ "John Carmack is suing ZeniMax for $22.5 million and I just want everyone to be friends". The Verge. 10 March 2017. ^ Rubin, Peter. "Oculus Rift Review: Rejoice, for the Age of [:] ) Has Begun". WIRED. Retrieved 13 October 2016. ^ "Oculus Rift Review". IGN India. 5 April 2016. Retrieved 13 October 2016. ^ Dormehl, Luke (28 March 2016). "Oculus Rift Review: VR's Rising Star Isn't Ready for the Mainstream". Retrieved 28 March 2016. ^ Dormehl, Luke (28 March 2016). "VIRTUAL REALITY IS ALWAYS ALMOST HERE". Retrieved 28 March 2016. Wikimedia Commons has media related to Oculus Rift.